HOT From Koch :: Lorena Sarbu Imagines Elegance, Desire & Ultra Feminine Mystique for Nominee Sharon Lawrence During the 61st Annual Primetime Emmys! Designer Lorena Sarbu proved her wares and opened eyes yet again on Sunday, September 20, 2009 during the 61st Annual Primetime Emmy Awards. Fresh from her design presence on 2009 Emmy winner Tamara Braun at this year’s Daytime Emmy Awards, Lorena Sarbu is poised to make another punctuation on the couture scene. At Emmy’s Primetime version, veteran actress Sharon Lawrence’s talent, beauty and sophistication played muse to Lorena Sarbu’s ode and re-imagining of golden Hollywood’s elegant red carpet past. For the special engagement, Lorena Sarbu conceived for Lawrence an elegant high-neck navy gown, fabricated with exquisite crepe back satin that serves as a deco inset, creating a gleaming echo of graceful curves. The “wow” factor is cemented with Lorena Sarbu’s employment of airy silk chiffon as accent to the gown’s train. Lawrence, in stunning Lorena Sarbu couture, graced the red carpet of the 2009 Primetime Emmy Awards exuding the glamour, fantasy and allure which such a Hollywood occasion calls for. Lorena Sarbu is a couture designer and entrepreneur. Her design creations have been represented at awards shows, on the red carpet, industry affairs, on celebrities, socialites, and on the woman who explores, understands and embraces unique and exquisite fashion. In 2010, Lorena will launch her much anticipated ready-to-wear line, which will be showcased in both her Beverly Hills and Milwaukee boutiques. 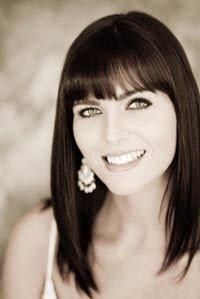 For more information about Lorena Sarbu, visit www.lorenasarbu.com. For interviews, please contact Eileen Koch @ Eileen Koch & Company INC, 310.441.1000 or email Eileen @ Eileen@eileenkoch.com. Please visit www.eileenkoch.com. HOT From Koch :: Lorena Sarbu Gown Delivers Sensual Elegance as Shohreh Aghdashloo Wins at 61st Annual Primetime Emmy Awards! From the red carpet to the awards podium, Shohreh Aghdashloo dressed in a striking iridescent blue Lorena Sarbu couture, was a vision of beauty and grace amongst her peers during the 61st Annual Primetime Emmy awards. The ethereal and light Lorena Sarbu gown embodied glamorous perfection, employing Italian silk chiffon melded with an exquisitely pleated bustier. Delicate expanding straps kissed Aghdashloo’s shoulders as the gown’s rear criss-cross straps acted as elegant, enticing framework for her back. 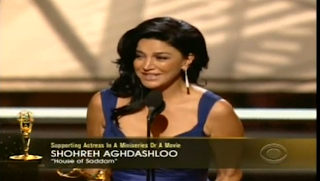 On Sunday, September 20, 2009, Aghdashloo captured her first Emmy win as designer Lorena Sarbu continues to make her design presence felt at Hollywood’s biggest television awards ceremonies. Aghdashloo’s triumph places Lorena Sarbu’s designs in Emmy’s winner circle for a second time this year. During the 36th Annual Daytime Emmy Awards held earlier this month, Tamara Braun walked Emmy’s victory steps in a stunning Lorena Sarbu pewter chiffon and silk mermaid gown. Passionate about marrying design creation with the talent’s own unique personal aura and allure, Lorena Sarbu’s custom creations are alive in so many ways, which set her apart from the rest of the couture set. The Emmy’s has witnessed the wondrous enchantment of Lorena Sarbu… Oscar is next! For more information or to interview Lorena Sarbu, please contact Eileen Koch @ Eileen Koch & Company INC, 310.441.1000 or email Eileen @ Eileen@eileenkoch.com. Please visit www.eileenkoch.com. EKC Client Lorena Sarbu Featured in Celebutante Sisters! Lorena will be donning a few nominated leading ladies on the red carpet during this year's 61st Annual Primetime Emmy Awards! Be sure to tune in this Sunday, September 20 on CBS to see the lucky stars that will be wearing Lorena's gowns! FundingFactory’s recycling program participants are about to receive a more star-studded and tastier surprise. Beginning Monday, September 14, 2009 FundingFactory (www.fundingfactory.com) will add to their extensive list of incentive programs for schools and non-profit groups. The “Reel Tasty” program will award bonus rewards in the form of either movie or pizza gift cards. The new bonus period is slated to continue through August 31, 2010. Under the new initiative, new and existing FundingFactory participants who register for the FREE Movie/Pizza Bonus will earn their choice of a free movie or pizza voucher for every 50 qualifying items they send to FundingFactory during the bonus period. The Pizza Party bonus will be presented in the form of a Papa John’s e-gift card, while the movie bonus can be redeemed at over 20 participating theater chains, including Cinemark, AMC and Regal Cinemas. These bonuses are in addition to what participating organizations already earn for their qualifying recycled items. 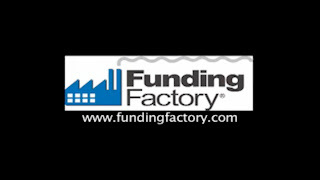 FundingFactory is the leading online fundraising-through-recycling program available in the United States. Acting as a facilitator, FundingFactory encourages schools and non-profit organizations to collect empty printer cartridges and old mobile phones from their respective communities, and then assists in delivering the collected materials to the proper recycling entities. To date, the funds raised through FundingFactory’s recycling programs have exceeded $20 million. Recently, the program has experienced rapid growth as more and more schools and groups are learning the value of fundraising- through-recycling. For more information on the “Reel Tasty” Incentive Program, visit: http://www.fundingfactory.com/reeltasty.aspx. To interview FundingFactory, please contact Eileen Koch @ Eileen Koch & Company INC, 310.441.1000 or email Eileen @ Eileen@eileenkoch.com. Please visit www.eileenkoch.com. HOT From Koch: iBC Launches Innovative New Daily Talk Show "That Morning Show" Premeiring September 14! On Monday, September 14, 2009, television morning talk will welcome several new faces and a whole new format, as television/internet-commerce conglomerate iBC (www.ibc.tv) debuts “That Morning Show.” Airing every morning, seven days a week, “That Morning Show” is an upbeat and topical lifestyle show featuring both in-studio and field pieces in an unconventional new format that is fast-paced, upbeat and always fresh. Offering lighter and more uplifting fare, “That Morning Show” focuses on topics that will enhance the lives of its viewers. From the workplace to the kitchen, the world of fashion, or new environmental projects, iBC’s new production will meld entertainment and information in a way aimed at making viewers hopeful, empowered and informed. The program will be hosted by a trio of fresh faces, each offering their own unique perspective on the variety of topics to be featured on “That Morning Show.” Mark Long, Karla Cavalli, and Chelsea Cannell will welcome viewers to the start of the new day with a warm chemistry and addictive energy. The in-studio portion will be filmed in a state of the art studio in Orange County built exclusively for the show. The unique platform stage allows the hosts versatility and function in presenting new discussions on varying topics while keeping the flow fast and visually pleasing. The outside studio segments will transport viewers to fun and exciting locales all across the country. Airing seven days a week, the only thing missing from this fast-paced program will be traditional national commercial breaks. Instead, iBC’s innovative interactive marketing segments will provide viewers with a completely new way of saving money at their favorite retailers that is easy and appealing. The talented Sandra Sanchez, Carmen Palumbo and Aaron Priceman take the helm in this new frontier along with a bullpen of additional hosts who will showcase opportunities for viewers to obtain gift cards from major retailers and, importantly, receive cash back with each purchase. A ticker counts down until there are no cards left. Viewers who miss out on the action can visit the website 24 hours a day to receive their cash back. The incentive program, iBC’s brainchild, moves the traditional talk show viewer from spectator to active participant. The viewer can see how many gift cards remain and decide to purchase as the amount of cash back increases. During the segment, some purchasers may even see their names scrolled across the screen. 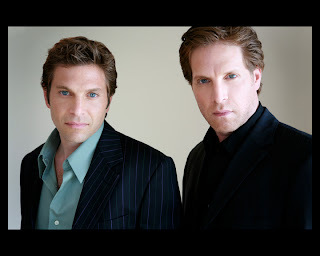 “That Morning Show” is produced by iBC and will air beginning Monday, September 14, 2009, from 6:00-9:00am (ET & PT), coast to coast, with episodes airing seven days a week. Check your cable network listings. For booking information, please contact Stacey Margetts at smargetts@ibc.tv or call 949.852.8100. To schedule an interview with iBC, please contact Eileen Koch @ Eileen Koch & Company INC, 310.441.1000 or email Eileen at Eileen@eileenkoch.com. Please visit www.eileenkoch.com. iBC (iNtertainment Broadcasting Corporation), is a leading innovator in connecting retailers directly with consumers through interactive media. Their new morning television program, “That Morning Show,” broadcasts seven days a week, coast to coast. Viewers can purchase gift cards from a variety of retailers and receive a bonus "cash back" award with each purchase. iBC is backed by leading entrepreneurs and The Musser Group. For more information, visit www.ibc.tv. LOS ANGELES, CALIF. – From its conception, designer John Varvatos’ seamlessly melded synergy of Rock ‘n Roll and classic structure has been a composite for a much-needed, fresh, new genre. 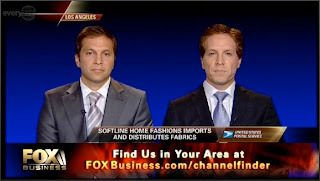 On September 24, 2009, Varvat os will hold premiere designer honors as the nation’s largest and most coveted fashion sale, The Warehouse Sale (www.thewarehousesale.com), makes its first Los Angeles appearance. Varvatos’ inspirations come to life and have, and will continue to be, embraced as the quintessential Los Angeles style. His design creations, revered the world over, will find life most harmoniously in the vast fashion cultures of the City of Angels. The four-day fashion event will take place at The Los Angeles Convention Center and its September presence in the Southland will mark the first time L.A. clients will be privy to this level of highly discounted offerings on the designs of John Varvatos. Angeleno male attendees of the event will be able to purchase Varvatos dress wear, outerwear, leather jackets, jeans, shorts, sweaters, shoes, accessories and much more at below wholesale prices. An invite-only, “first peek” day will launch the sale on Thursday, September 24. Then on the following day, September 25th, The Warehouse Sale will open its doors to the masses. With price points reaching up to 90 percent off (the lowest prices they have ever offered! ), The Warehouse Sale premieres in L.A. at the right time and with a boom. Full size runs will be available at commencement and choices will be numerous, with more than 15,000 dream-worthy items to ponder over. Admittance will be by RSVP only and will be required for each day of attendance. The sale will breathe sprightly each day from 10AM to 8PM PT and wil l run through Sunday, September 27. 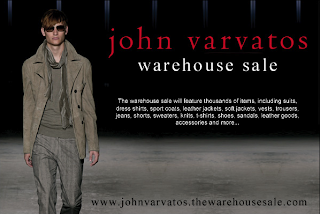 To RSVP for The Warehouse Sale’s Los Angeles events, please visit, www.johnvarvatos.thewarehousesale.com. For interviews or more information on The Warehouse Sale, please contact Eileen Koch @ Eileen Koch & Company INC., 310.441.1000 or email Eileen @ Eileen@eileenkoch.com. The Warehouse Sale is an exclusive, invite and RSVP sample sale that offers the newest and hottest styles of the season in your favorite brands for both men and women. Get ahead of the trends and be the first to rock up-and-coming labels. With everything priced below wholesale, The Wareho use Sale makes it easy for you to try new styles or brands without guilt. For more information, visit www.thewarehousesale.com. LOS ANGELES, CALIF. and SAN DIEGO, CALIF. – September 3, 2009 – Rhythm, pop and dance radio stations are heeding the call of prodigy pop/R&B siren Abrina. Almost as soon as Abrina stepped out of the studio to complete the recording of her new single, the local airwaves snatched it up like cookies and placed it into circulation. Immediately, listeners’ demand warranted the play count of Abrina’s new song graduate into heavy rotation. Abrina’s new single, “Cruel Summer,” is a remake of Bananarama’s ode to lost love. Being open and finding beauty in all types of music genres, Abrina has always been a fan of the eighties pop band. When her manager, Dale Soliven, proposed the remake of “Cruel Summer,” Abrina immediately and emphatically agreed. The challenges of re-imagining the eighties classic presented exciting new avenues for Abrina to stretch her talent and pay homage to Bananarama at the same time. Touching a cord with young fans, as well as old, the finished project equals phenomenal. When the San Diego native is not performing or on tour, she is perpetually in the studio working on her second full-length album. Besides the “Cruel Summer” release, the rest of the highly anticipated second offering from the Latin beauty is under tight wraps. One thing fans can expect from the twenty-year-old is that she will be bringing her unique R&B/pop mix to further heights. For a sneak peak at Abrina’s recording sessions of “Cruel Summer” and to listen to her talk about influences, love and life, visit vids.myspace.com and type “Abrina Cruel Summer.” To get more of your Abrina fix, visit her website at www.abrinamusic.com. Her self-titled album is available for purchase at CDBaby. To book, or to interview, Abrina, please contact Eileen Koch @ Eileen Koch & Company INC., 310.441.1000 or email Eileen @ Eileen@eileenkoch.com. Please visit www.eileenkoch.com. Made of Italian silk chiffon, the gown is amber-effected-blue that beautifully dances from a soft turquoise blue to lilac and lavender. The true beauty lies in not only the dress and its exquisite construction, but the vintage jewel encrusted earrings that are used to create the one-of-a-kind belt. Airy and light, the gown is reminiscent of something only Grace Kelly would adorn.